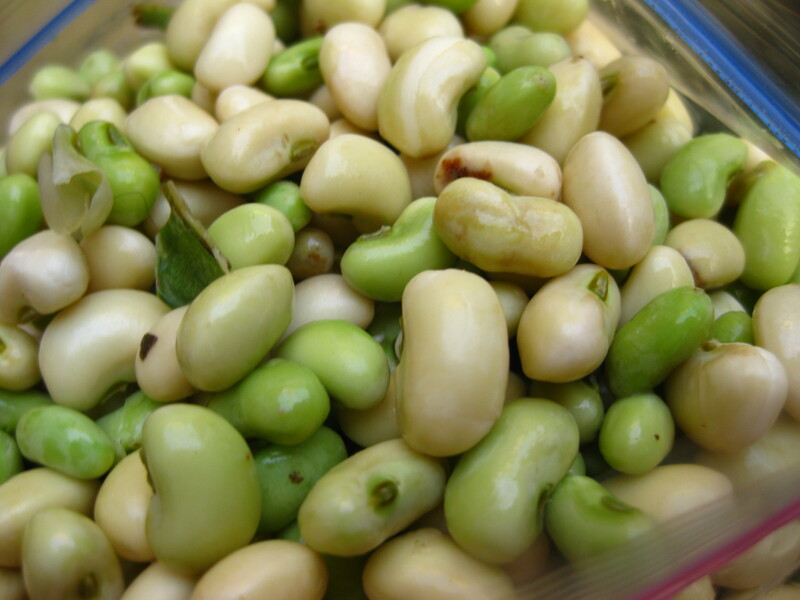 The first week I ever ordered a Local Box from Greenling, I got Lady Cream Peas. I had never heard of Lady Cream Peas, and I had no idea how to cook them. I cowered from the peas and cooked other, more familiar things until the peas went bad and I had an excuse to trash them. The next time around I was determined to Do Better and I turned to the internet for answers. My old standby allrecipes.com didn’t have a single recipe, but lucky for me there are lots of local food bloggers talking about fresh field peas! Your Vegan Mom has a good recipe if you need to feed a crowd, and WestCoastWine.net user Zachary Pearson posted a simple recipe that uses basic pantry spices. 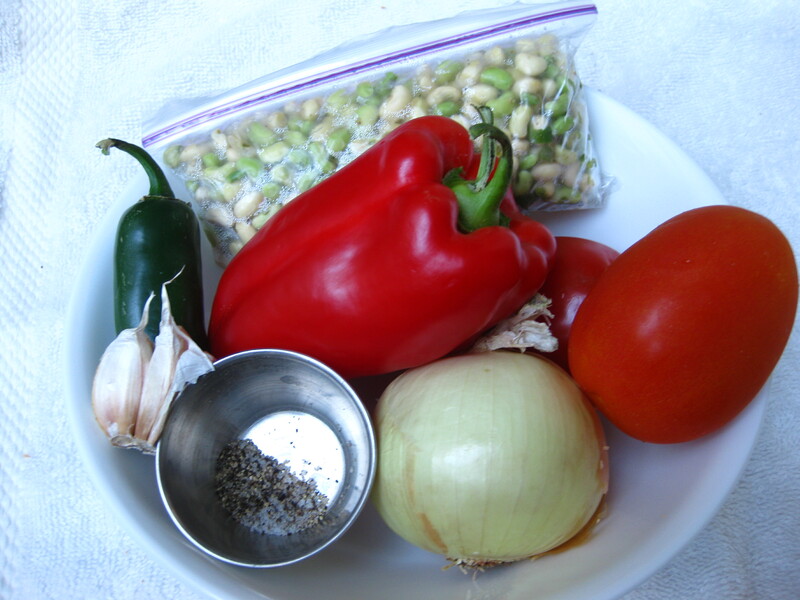 My favorite picture-by-picture explanation of the peas is from the blog Mommy’s Kitchen. Now that I’ve had Lady Cream Peas or their cousin, Purple Hull Peas, six times this summer, I’ve had plenty of chances to perfect my own version of this southern staple. I like my recipe since it uses lots of veggies that typically come in the Local Box with the peas, and because it is filling as a atand-alone entree along with some skillet corn bread. This recipe also uses a smaller quantity of peas than the others I found online: one snack size Ziploc bag full, or about 1.5 cups. In a heavy-bottomed (hee hee) saucepan, cook the bacon over medium heat. (If no bacon, start with a Tbs. olive oil.) Once the bacon grease begins to render, add the garlic, onions, and peppers. Add tomatoes, stirring constantly, after the onions begin to turn translucent. Once all the veggies are tender, add the peas and enough stock or water to cover things. Bring the liquid to a boil and cover. Simmer, covered, for 30-60 minutes*, until beans are velvety, creamy, lady soft. Serve in a bowl with the cooking liquid and a wedge of skillet corn bread**. *FYI, I have noticed some slight differences in cooking time between the purple hull and lady cream peas, so watch out for that if you decide to get adventurous with yer cow pea varietals. **Lady Cream Peas NEED to be served with corn bread. Not any mushy fluffy crumbly boxed cornbread either. Dense, southern style skillet corn bread is best since it will soak up the delicious cooking liquid around the peas. Do not mess around with the cornbread/creampea symbiosis. Just make the cornbread while the peas cook or else you will regret it forever and ever. Or until the next time you make peas, whichever comes first. This entry was posted in Gluten Free, Main Dish, Recipes, Soups & Stews, Vegan, Vegetarian and tagged Cornbread, Garlic, jalapenos, Pea, peppers, Tomato. Bookmark the permalink.